it did movies and TV. By 1973, Marvel Comics had already introduced The Black Panther and Luke Cage, Hero for Hire; and DC was on the verge of bringing out Black Lightning. The other trend, at Marvel at least, was toward heroes who combined the superhero motif with a horror/supernatural theme. Morbius the Living Vampire and Man-Wolf, formerly Spider-Man supporting characters, both got their own series right around then, and The Beast (who started out in X-Men) and The Cat (who started as a stand-alone superhero) were revamped into monster types. And then there were the out-and-out horrors, like Man-Thing, Werewolf by Night and Daimon Hellstrom, Son of Satan. Combine the supernatural with the black hero, and a voodoo-using superhero is a natural. Brother Voodoo was created by writer Len Wein (Teen Titans, Swamp Thing) and artist Gene Colan (Daredevil, Howard the Duck). He made his debut in Strange Tales #169 (September, 1973), a revival of the title that had introduced Doctor Strange and Nick Fury, Agent of S.H.I.E.L.D. in the '60s. Jericho Drumm was born in Haiti, as befits a practitioner of that particular branch of the mystic arts, but educated as a psychologist in New York City. Naturally, he didn't believe in the superstitions of his ancestors — until he returned to the island after 12 years in the U.S., and found his brother Daniel, a houngan (voodoo priest), on his deathbed, victim of an evil bokor (voodoo sorcerer) who had sicced Damballah, a powerful serpent god, on him. Daniel extracted a promise from Jericho to learn the ways of voodoo and avenge his death, which Jericho did. He studied under Papa Jambo, an aged master, who promptly died the moment his protegé attained sufficient skill. Before doing so, Jambo resurrected Daniel's spirit and merged it with Jericho's own, making Brother Voodoo the most powerful voodoo master of all. 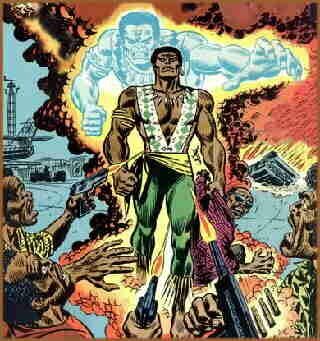 After defeating Damballah, Brother Voodoo stayed in Haiti as champion of the downtrodden. The series lasted only five issues before Strange Tales switched minorities. The 174th issue replaced him with a Marvel-ized version of the Jewish Golem legend, and Brother Voodoo hit the guest star circuit. He's been there ever since, and has achieved a certain degree of fame as a very minor and rather contrived Marvel character who somehow manages to cling to life decade after decade. You'd think he'd have faded to oblivion by now — but no. Cable TV's Sci-Fi Channel announced a Brother Voodoo movie to air in 2003. Tho the year has come and gone, it hasn't yet made an actual appearance. But still, he apparently isn't so minor and contrived that he can't make at least a stab at a comeback.